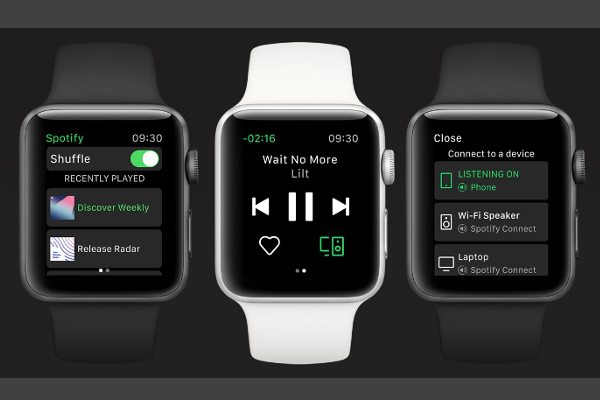 Spotify app for Apple Watch released. Today, Spotify is introducing a new app for the Apple Watch, giving you the ability to seamlessly access and control your favorite music and podcasts without missing a beat. With this new app, you can enjoy an improved experience with better control and the ability to seamlessly connect to your speakers or devices. The new integration with Apple Watch makes accessing your recently played songs simple, even with your phone in your pocket. Plus, if you find a new favorite track while on the go, just tap the ♡ icon on your watch screen to save it to your collection-and then feel free to stream it over and over again.